This is a 5 Double Spoke 16x6.5 Inch, 5x112mm Bolt Pattern, One Piece Aluminum Wheel, Rim. Offset is 50mm. The position on the vehicle is Universal. Interchange Number is 69812. Manufacturer Part Number is 1KO601025D8Z8; 1K0601025AJ16Z; 1K0601025D; 1K0601025BN. Identification Stamp Number is 1K0601025AJ; 1K0601025BM; 1K0601025D. 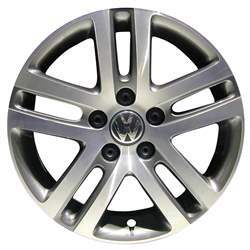 Our company is not affliliated with Volkswagen Group. All trademarks mentioned herein belong to their respective owners.